How To Declutter Your Wardrobe In 10 Mins! Can you feel it in the air? Autumn is coming! The last days of Summer are lingering. Time to reassess your wardrobe. Change of season is the perfect time to do a quick wardrobe declutter and audit. Before any shopping trip I always do a 10 minute mini declutter. I believe that when you move out the old (or things not serving you) you’ll create more space in your wardrobe and your life to welcome in the new 🙂 and seriously those things on your wish list start turning up. 1 – Focus only on the current season – in this case Summer! We have just had 6 months of sunshine and warmth. If you have Summer items in your wardrobe that you haven’t worn all Summer (then it is time to give them some love and pass them onto a sister, neighbour, friend or op shop). If you totally love the item then move it to the front. If you don’t wear it in the next month – time to let that one go sista! Does it fit me right now? Does the colour suit me? Stay – back in your wardrobe! Donate/Giveaway/Refashion/Sell – Bag up ready! 3 – My keeping pile – what to do with it? Take all the Autumn clothes you are keeping and start making outfits with them all. Make a list of anything you are missing to create your overall look – don’t forget jewellery and accessories too. This list will be handy for your next op shop trip or Raid My Wardrobe shopping day (so keep it safe)! So, that’s how I keep things moving and rotating in my wardrobe – keeping it feeling refreshed and renewed. Tonight take 10 minutes to go through your wardrobe. See if you can find 3 or more items that you can move on to someone else. Let me know how you go. 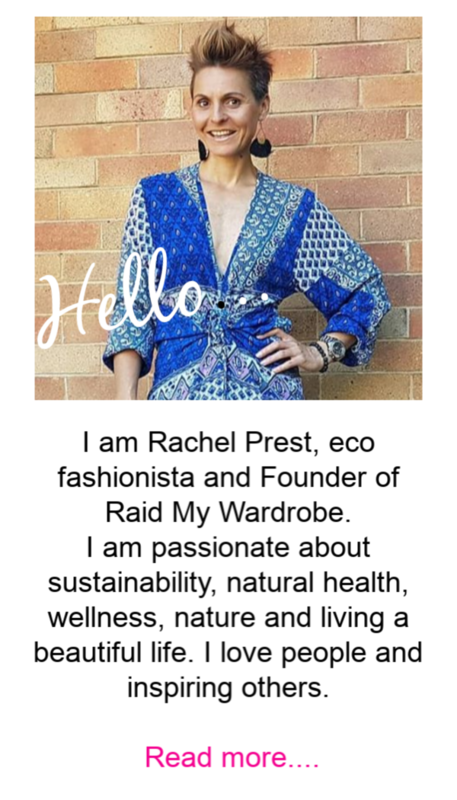 Rachel Prest is founder of Raid My Wardrobe. In 2010, she founded a preloved fashion event for women to refresh, recycle and reinvent their wardrobes. She began this blog in 2016 as a way to inspire, educate and encourage her community with more sustainable ways of fashion shopping, styling and creating. When she's not op shopping or planning the next event you'll find her down at the beach, walking in the bush or hanging out with her husband and kids. Rachel is based in Newcastle, Australia. « Ever Wondered What I Buy At Op Shops?